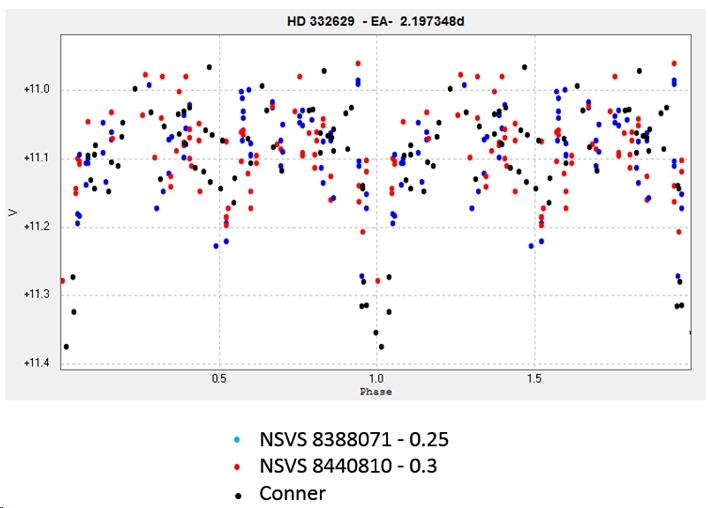 My 15th discovery, confirmed on 2016 February 12, is an eclipsing binary in Cygnus - my first eclipsing binary discovery. AAVSO VSX entry here. Photometry from 56 images taken with the Bradford Robotic Telescope Cluster Camera between 2014 July 23 and 2015 December 18. Cluster Camera's 'G' (green) filter was used. A period of 2.197348 days is suggested. ​This one was difficult. My original submission to the AAVSO VSX consisted of my observations alone, based on the following 'discovery' charts. This is plotted with a period of 2.197348 days. The precision of this period is better than one tenth of a second! 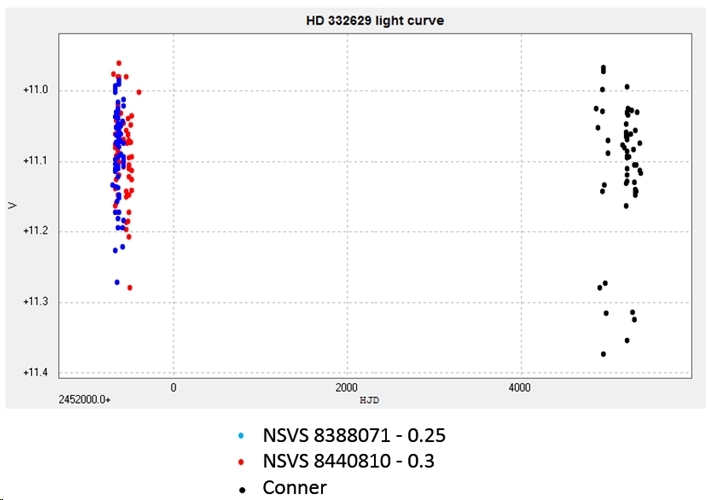 The curve and phase diagram are very noisy because my photometry is from images exposed for a much brighter star (the mag 6.5 V1765 Cyg), not this mag 11 star. The NSVS data is also very noisy. Ideally, this star will now be observed with correctly exposed images to better determine the shape of the phase diagram. It is catalogued as an EA, but it might possibly be an EB; it's impossible to say with such a noisy curve. This would require a telescope such as the Bradford Robotic Telescope's Galaxy Camera but, at the time of writing (2016 February 14), the BRT is out of commission and its future is unknown, so it might be a while before these observations are forthcoming! 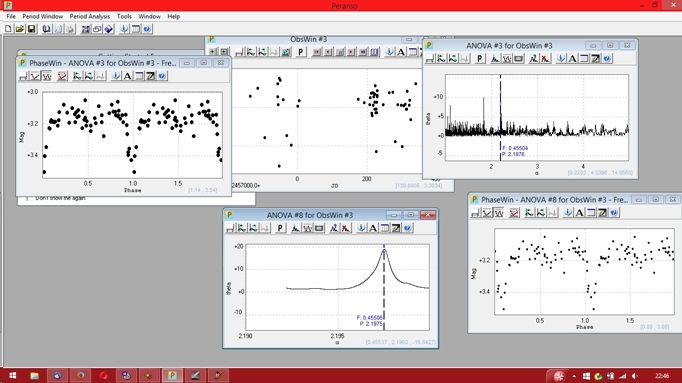 ​This is a first attempt at modelling the system, using an applet from the University of Nebraska-Lincoln. The primary is assumed to be the catalogued A0 star, similar to Vega, and the best fit secondary is an F5 star at a distance of approximately 7.45 million km. The following light curve and phase diagram were obtained from photometry of 77 images taken with the Open University 14 inch Schmidt-Cassegrain COAST telescope through a V filter between 2017 June 17 and 2017 December 27. There is some suggestion that the secondary minimum doesn't quite occur at phase 0.5 but is slightly later. More observations needed!